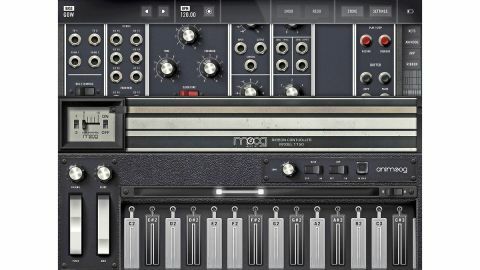 An excellent recreation, the Model 15 App brings the raw sound quality of a vintage analogue synth to iOS users for a great price. Easy on the eyes. Excellent inter-app interfacing options. Costs 333 times less than the hardware version! No ability to swap out modules. Modular analogue synthesis is bigger than ever with a multitude of boutique and big name manufacturers getting in on the action. Moog recently joined in with limited reissues of its Model 15, 35, and 55 systems, albeit at prices only a few can afford - the smallest system, the Model 15, comes in at $10,000. Moog's latest product brings that same Model 15 to iOS devices for the considerably lower price of £22.99. Moog's software engineers have pulled out all the stops to recreate both the sound and appearance of the real deal, drawing upon Apple's Metal graphics acceleration technology to ensure the interface's authenticity. This means it'll only work on 64-bit devices including iPad Air and later, iPad Pro, iPhone 5s or newer and iPod Touch 6 and up. The App Store lists a minimum requirement of iOS 9.0, but in fact 9.3 is necessary to install Model 15. The Model 15 offers a basic but serviceable collection of synthesizer modules consisting of a handful of oscillators, filters, envelope generators, mixers and modulation options. Unlike a hardwired synth like the Minimoog, the Model 15's various components may be patched together as you see fit by means of virtual patch leads. Interestingly, where the original system was strictly monophonic, the Model 15 App allows four voices of polyphony. The Model 15 App would better be described as 'semi-modular' since the number and type of modules available is fixed. We'd like an option to switch out or add modules, perhaps as in-app purchases. "Great sounding synths encourage learning and the Model 15 is exactly that." The entire cabinet can be displayed in portrait mode and you can zoom and scroll using the usual gestures or via the bar on the right.So what modules are included? To start with, there's Moog's 921A Oscillator Driver and a pair of associated 921B Oscillator modules. Users of Moog's modular systems or its many clones will be familiar with this arrangement, wherein the 921A offers various control inputs, a master frequency and pulse width control to which the 921B oscillators are slaved. Additionally, there's the self-contained 921 VCO independent of the others. All oscillators offer their own frequency and range of options (low frequency oscillation is possible) as well as individual outputs for saw, sine, triangle, and pulse waves. The 921Bs offer 'Synch' inputs with weak or strong synch modes, as well as AC and DC mod inputs. The standalone 921 provides auxiliary output with a selectable waveform and level control, as well as frequency inputs and a Clamp Trig input that can be used to restart the wave when an incoming trigger is received. Naturally, Moog have included some of their famous filters. A 904 low-pass filter is the classic 24dB resonant job, with selectable frequency range and a trio of mod inputs. A 1U 923 module contains simple low and high-pass sections, along with white and pink noise. The 907A Fixed Filter Bank has low and high-pass shelves and eight additional fixed bands. Dual voltage control amplifiers with linear or exponential curves are provided, and there are a pair of four-stage envelopes that retain Moog's potentially confusing tradition of putting the Sustain segment at the bottom. Utility modules come in the form of Attenuators, Reversible Attenuators, four-input Mixer, and a Controller Output module. Two sets of four interconnected Multiples are included as well. Modules not found in the hardware cabinet provide audio and MIDI bridging to the outside world, more Reversible Attenuators and simple amplifiers, plus a Recorder that can loop and overdub anything you play, as well as sharing it via email, AirDrop, and with other apps. A delay with modulatable time and feedback is a welcome inclusion. Audio and control sources and destinations are interconnected via patch cables. You can choose any of six colours and double-tapping will render the cables semi-transparent. Cables are created and connected by tapping a jack and dragging the lead to its desired destination. Helpfully, all allowable destinations for a given output are highlighted and vice versa. Double-tapping source and destination alleviates the need to drag a cable. We won't pretend that patching a modular is easy - this is advanced stuff, and it's a brave soul indeed who taps the 'New Preset' button. Thankfully, Moog have provided 160 excellent preset patches in a variety of categories, along with 20 templates and a couple of tutorial patches (more presets are available as in-app purchases). A thorough manual is also included. Great sounding synths encourage learning and the Model 15 is exactly that. It's too bad that so many of the presets are drenched in delay, since it can mask the often breathtaking beauty of the raw sound. We weren't able to compare it to a real Model 15, but it held its own against a restored Minimoog Model D, giving that familiar full-bodied Moog tone. It fared especially well in the low registers - where clones often fall apart. The oscillators have all the oomph of vintage hardware and the filters sound utterly convincing. There are other iOS modular synths, some far more complex and flexible, but the Model 15 is one of the few that just might satisfy the retro-fetishist.